BROOKLANDS: Steeped in history, Brooklands is a captivating 'Aged in Place Museum', there's not too much glamour and precious little chrome. There is however, total dedication to preserving vehicles, buildings and competitive events in keeping with the era of the cars, motorcycles and aviation that appear at events throughout the year. The main event at Brooklands each year is the Double Twelve when a magnificent collection of classic and vintage cars and motorcycles take part in driving tests and a Concours D'Elegance over two days, the Double Twelve Driving Concours and a Double Twelve Sprint for pre-war cars on the adjoining 'Mercedes Benz World' circuit. The 'Double Twelve' borrows it's name from meetings organised by the UK Junior Car Club (JCC) at Brooklands from 1929 and takes it's inspiration from rallies organised by the JCC and the RAC in the late 1930's in which the elegance of the competing car was as important as the skill of the drivers performing tricky manoeuvres. I make no apologies about starting my records of recent visits to Brooklands with the Napier Lion, Packard and Merlin engined Cars, absolutely intoxicating presence and the sounds they all make, outrageous! This page is dedicated to the Napier Lion Engine and it's use in motor vehicles. 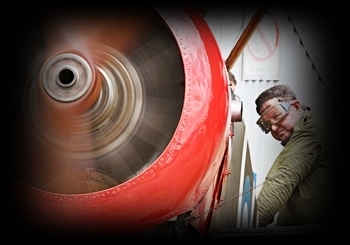 It is a massive aero engine designed and manufactured by Napier from 1917 until the late 1930s. The engine incorporates a unique design with three separate banks of four cylinder engines offset at 60 degrees from one another offering an overall displacement of twenty four (24) litres. Each four cylinder DOHC block is interconnected to the one common crankshaft and each crankshaft main bearing has three connecting rods. Various power outputs are claimed ranging from 336~671kW, (450~900bhp) normally aspirated. 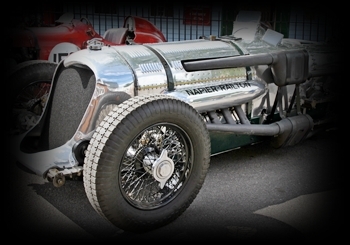 The 'clickable' image depicts John Cobb's record breaking Napier Lion powered 'Napier-Railton'. Obvious really, take one giant Aero Engine of the day and slot it into a decent car chassis! Of course one imagines that there are limits, not here! This page is devoted to two massively over powered but nevertheless magnificent cars, a 42 Litre Packard powered Bentley and a somewhat smaller capacity 27 Litre Merlin powered Rolls Royce. 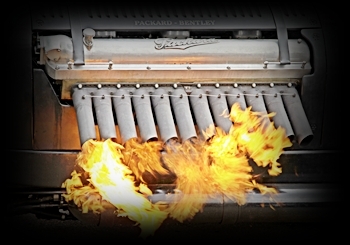 The 'clickable' image depicts the fire breathing 42 Litre V12 Packard-Bentley, at idle! In addition to the Napier Lion, Merlin and Packard powered marvels, Brooklands has a permanent display of many race and land speed record cars. 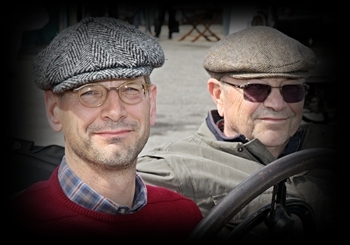 During annual events like the Double 12 there is an enormous gathering of Veteran, Vintage, Concours d'Elegance, Club and Special Anniversary cars on display. 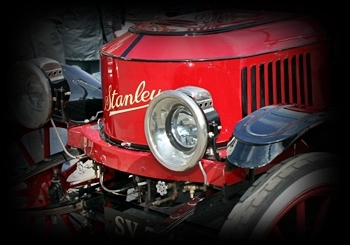 The 'clickable' image depicts a 1914 Stanley Steamer. Brooklands has a limited number of motorcycles on permanent display, nevertheless the original circuit hosted some astounding attempts at land speed records. 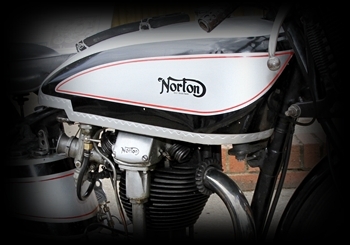 The 'clickable' image depicts a 1933 International 350cc Norton fitted with a 500cc engine. Racing at the Brooklands Double 12 includes driving tests and a Concours d'Elegance over two days, seemingly every type of car, motorcycle and even a pair of Segway's had a go at the Hill Climb, then there was the matter of hauling a car up the hill with ropes and a new record time was set. 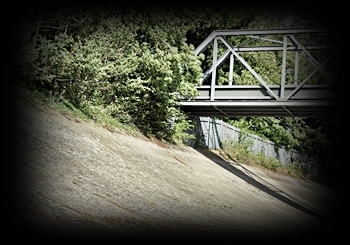 The 'clickable' image depicts a Vintage Car about to tackle the Hill Climb. Brooklands, truly a magnificent place, not a sanitized Memorabilia Display, entering Brooklands is like entering a Motor Sport and Aviation Time Warp. There are some significant cars and motorcycles on permanent display within the Museum Buildings, most displays are in original condition which is most appropriate. 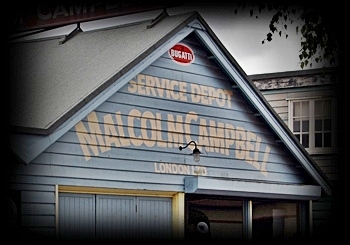 The 'clickable' image depicts the appropriately named 'Malcolm Campbell' Service Depot. The two words are synonymous with one another. Irrespective of the marvellous cars, motorcycles and aircraft it is the Entrants and Competitors that take Brooklands to another level. Their friendliness and their desire to 'look the part' is all great stuff. Brooklands, a low pressure enjoyable place to be. 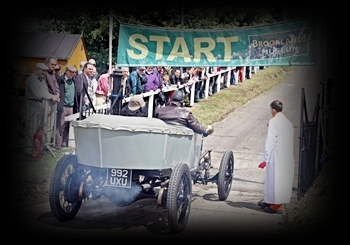 The 'clickable' image depicts a driver and navigator dressed appropriately in the staging area for the Hill Climb event. I am very proud to now own a 'square yard' of the Brooklands Banked Track, to clarify I have purchased a 'square yard' to assist the Brooklands Museum to raise much needed funds to secure the future of the world's first purpose built motor racing circuit which dates back to 1907. The 'clickable' image depicts the approximate location of my 'square yard', forward of the bridge.